Cycling enthusiasts can expect to see prices head uphill for bikes made of in-demand specialty materials such as titanium and carbon fiber. Driving the increase is a sharp rise in orders for airplanes made of the same materials, meaning that bike makers -- along with makers of sailboats, lacrosse sticks, tennis rackets, jewelry and bone screws -- are paying 25% more for raw materials and passing along some of the costs to consumers. Prices for high-end bikes from makers such as Trek Bicycle Corp., Cannondale Bicycle Corp., and Serotta Competition Bicycles, some of which already cost more than $10,000, could rise 5% to 25%. A custom-made La Corsa titanium frame from Serotta, for instance, would sell for up to $7,000 with top components by the end of this year, up from $6,000 in January. Amid rising demand, titanium and carbon-fiber makers are largely catering to their bigger customers: the aerospace industry. Zsolt Rumy, chief executive of St. Louis-based Carbon Fiber maker Zoltek Companies Inc., says he is trying to keep prices lower for bigger customers by raising prices for smaller ones, such as bike and golf-club makers, who constitute 15% of his company's business. "We really jack up the price" for smaller customers, he says. He's passed on more of the 60% to 100% increases to sporting-goods customers. The article repeats an oft-heard misapprehension, that titanium is as strong as steel and as light as aluminum. Titanium makers say their silvery gray product, made by refining and melting an ore extracted from rutile sand found in Australia and elsewhere, has the strength of steel and the light weight of aluminum. But it's far more expensive than both: Titanium can cost more than $32,000 a ton, compared with less than $1,000 a ton for carbon steel. The price of high-quality titanium, aluminum and carbon fiber has risen as orders from airplane makers and defense companies such as Airbus, Boeing Co. and Lockheed Martin Corp. are buying up a greater portion of the supply to keep up with demand. Actually, titanium weighs quite a lot more than aluminum, 280 pounds per cubic foot versus aluminum's 169 pounds per cubic foot. It is stronger, so you can get by with less of it in smaller tube diameters and make very light frames, but let's not mistake that for being lighter than aluminum. It is lighter than steel, which comes in right around 500 pounds per cubic foot. It also has a much higher melting point that aluminum, which is handy if you're making, say, Mach 3 aircraft, but I typically don't ride fast enough that atmospheric drag dangerously heats up my bike frame. You want a nifty material? How about magnesium, at 109 pounds per cubic foot? There are people making bikes out of magnesium. You'd better hope like hell they don't catch fire! The tight supplies of titanium and carbon fiber, a strong lightweight synthetic material, come as the bike industry keeps expanding. About 19.8 million bicycles were sold last year in North America, up 8.2% from 2004, according to the National Bicycle Dealers Association. Sales of bikes and bike-related parts topped $6 billion last year, up from $5.7 billion in 2004. Some bike makers estimate that 30,000 cyclists each year spend $3,000 or more on a new bike, a $90 million market. But the growth also reflects the ever-escalating upgrades in bike models. Bike makers now use laser measurements, computer simulations, test-ride videos and drawings of a rider's body dimensions to create a more perfect ride. The desired growth in sales, coupled with tightening demand for raw materials, puts the bike industry in a bind. A new wave of affluent cyclists is increasingly willing to pay higher prices for bikes that weigh less and are made of high-tech materials. But bike makers believe high prices eventually will hurt sales for middle-class buyers and could cause a return to other, cheaper materials such as lightweight steel. Cheaper bikes at retailers such as Wal-Mart Stores Inc. are typically made of steel. Older cheaper materials like steel? Wal-Mart bikes? What a slap in the face to us Rivendell riders! I've always thought that the cutting-edge materials use in bikes was pretty neat. I don't partake in the fancy materials myself, sticking with brazed lugged steel frames and forged aluminum components for the most part, but for all the technology cars brag about, it's bicycles where advanced steel alloys, aluminum, titanium, stainless steel, magnesium, carbon fibre and even beryllium are used to hit lightweight high-performance targets. It's possible to produce bikes in these advanced materials and have them used in real-world conditions so that knowledge advances (I'm old enough to remember some of the early attempts like the Exxon (really) Graftek, the Viscount bike with the failing aluminum forks and the Teledyne Titan) . Military aircraft have used these advanced materials for years, they began to work their way into commercial aircraft in the last round of model introductions, and now are going to be used extensively in the new generations of planes like the Boeing 787 and Airbus A380 and A350 models. That's where all the big-volume demand is coming from and driving up the prices for your Litespeeds and Trek OCLVs. Does this affect us Practical Cyclists? I'm guessing most daily commuters and ride-to-the-store cyclists aren't using carbon and titanium frames. Plain old steel works fine and some nice Practical Bikes like the Breezers are aluminum, partly for anti-corrosion reasons, but using exotic materials would only make the bike more attractive to thieves I think. I'm not going to fret about the rising cost of carbon fibre and titanium, I'll leave that to those who chase the latest in cycling technology and keep riding my steel steeds. It is going to hurt, though, when I get my titanium-masted carbon-fibre yacht. Curses! I got a call from Wells Fargo. It started off as an email, apparently unaware of the prior communication I'd had through the account messages, and which I had quoted earlier. "I would like to speak with you regarding the feedback you provided about our Arden Hills branch and the drive up. Is there a number and time I could reach you? If you would rather, you can call me so we can discuss this further. I look forward to speaking with you." It was from an Administrative Assistant for the Northeast Metro and Northeast Suburban Districts of Wells Fargo Bank. I called Katie and left a message. She called back. She was pretty cheerful but the news she bore wasn't good; the teller who had initially refused to serve me that Friday afternoon was correct, the ones who had previously taken my deposits and the one who did so the following Monday were in error. It is for my safety. She went on about how it's hard to see cyclists and often car drivers aren't watching when they come up to a drive-through and could run into me and the pavement is sometimes uneven and the tellers can't see us. I said that I am taller than a car, nobody's going to have trouble seeing me. What about a pickup? she countered. I look over them, I said. Visibility isn't an issue. Katie carried on; it wasn't that Wells Fargo doesn't want my deposit or is trying to make it hard to do business but it's for my safety. 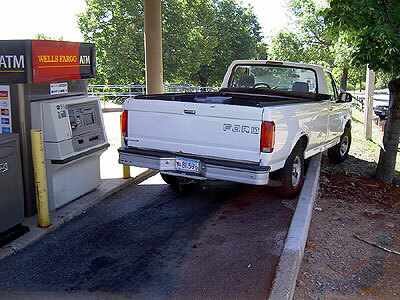 Look, I said, I ride all over the place and I deal with distracted and oblivious drivers all the time, a drive-through lane at a bank is just about the least of my worries. Oh but there's been an incident she said ominously, she talked to the Risk Management people, looked right at their internal website (not public, I looked) and there was some sort of incident that has brought this to the forefront again and they want to remind all the branches of the company policy. What sort of incident, I asked? Katie wasn't sure, of course, and thought she couldn't even find out, though she did say it was in Metro Minnesota so could be most anywhere. Now Where Did I Put That Deposi...Yaaaah!! When the other person answered they said it was up to the branches, I said. What other person?? Katie sounded surprised for once. She didn't know about the response I'd had previously. I read it to her. She was dismissive of that response; that's just an Online Customer Service Representative, she said, she could be in Phoenix or somewhere and not even be familiar with the specifics of the different branches. Don't you see we're doing this for your safety and that of other cyclists and pedestrians? I said it sounded like the Nanny State, trying to protect us from ourselves. I proposed to her that if the problem were that motorists were running into people, perhaps it is motorists who should have to park and go inside since they were the ones causing the problems. She laughed; this obviously wasn't a solution. What about mopeds? I asked. Would you serve a moped? It's motorized. Wouldn't that still be classified as a bicycle, she said? Maybe it it's under 50cc, but it's motorized. Well, she said, it makes noise so drivers would notice it. Well then, what about my boss's Honda Accord Hybrid; when it stops, the engine shuts off and it makes no noise. Or what about an electrically-driven bicycle (like the Stokemonkey-powered Xtracycle, though I didn't cite the model)? It would be motorized. She wasn't sure, said that with the ever-increasing variety of vehicles maybe some adjustments would have to be made. I think she thought I'd be so grateful that Wells Fargo was concerned for my safety that I'd just say gosh thanks I hadn't thought of that and that would be it. I don't think drive-through restaurants allow bicyclists or pedestrians, she said. Partly true, I said. In the discussions from my blog entries about this it came out that Wendy's and Taco Bell do not serve drive-throughs but that I had personally gone through MacDonalds as recently as last summer without issue. Oh, she said. I don't think she's done the research on who allows what. And you know, I said, my Wells Fargo check card has a stagecoach on it. You wouldn't serve that? She laughed? OK, I said, maybe you don't see many stagecoaches (actually, not true. According to Wells Fargo's own site, a WF stagecoach will be in tomorrow's Minnesota daily State Fair Parade), but what about the Amish? They're in horse-drawn buggies. She didn't know. I'm not sure they use banks she said. They have money, I pointed out. They probably tie up the horses outside and come in she said brightly but you could tell she was making this bit up. She tried to make it seasonal. Do you ride in the winter? she asked, sensing a trump card. Yes, I do, I said. Oh, well most people don't, and there would be a danger of people slipping and cars not seeing them and running into them. Look, I said, I ride all over town in the winter and deal with cars all the time. My favorite bit was when I pointed out there was no bike rack at the Arden Hills branch. She said I could take my bike inside and if anyone asked just say I was a drive-through customer but that I couldn't be served. She told me that going inside was pretty quick. No it's not, I said, last time I went in it was about a 15 minute line. Well, it's kind of hit and miss, she said. What I didn't think of at the time, but did after, is how delicious it would be to take my bike inside in, say, February. I learned riding last winter that when you park your bike in a warm building, all the crap melts off. I wonder how the branch manager would react if I brought in a slush, snow and salt-caked bike and cheerfully said "Oh, I can't use the drive-through and Katie said I could just bring the bike inside with me!" as little blobs of filth dripped onto the carpet. It was all cordial. She's got some oblivious and safely anonymous Risk Management Department on one side saying "Horrors! We must keep cyclists out of our drive-throughs so our innattentive and unseeing motorized customers won't run them down" and some pesky customer on the other wondering why it is that his vehicle choice makes it so hard to use the stupid drive-through, with a clueless Online Service Person chipping in three weeks earlier with possibly incorrect information. Her title is Administrative Assistant, so she has no decision-making authority and probably the boss gave it to her and asked her to handle it, which she cheerfully and doggedly did, she could be a White House Press Secretary. She kept brightly assuring me that Wells Fargo values my business and isn't trying to make it hard to do business with them but that they have my safety in mind when they made up this rule. I told her I understood the message, and that for the moment I would just use the drive-through ATM for my mobile banking needs. Hello again. I've been on something of a hiatus the last month (a lot of the usual bloggers have been quiet during this time as well), triggered by the visit of an aunt of mine from England in late July to early August and then having to do some work in Des Moines for my father. My father lived in Des Moines alone until last March when, because of a back injury on top of his pre-existing early-stage Parkinson's disease, he went to hospital and then to a nursing home. He picked a facility in Bellevue, Iowa, where one of my sisters lives, and I took him there at the end of a tumultuous and unexpected week in mid-March. Happily, he has improved a lot since then, a combination of therapy and probably of having the right medications properly administered, and improved enough to move into an apartment adjacent to the nursing home. He's pretty chipper now. His sister, Margaret, Auntie Margaret to me all my life and to Karla and the kids, decided to come see him. She fitted this in between her other trips, to Vietnam and Morocco and Italy earlier this year, to Belgium and Costa Rice coming later. Not bad for an 85-year-old retired schoolteacher. She came right in late July and was here for two weeks, returning right before the latest terrorist airplane bomb scare in London but knocking out three of our weekends from the normal routine. Then, this past weekend, I did the 800-mile loop, here to Des Moines, where I met my sister and loaded her Suburban and my pickup with Dad's furniture and hauled it to Bellevue, then drove home. It'll take another trip to get the rest of what Dad needs, then some work on the house before we sell it. Looking back at the blog last year, it seems I had lots of time to go for rides and take photos; this year, many weekends since March have been taken with Dad-related work. The last entry was about a fire on the Short Line bridge over the Mississippi in Minneapolis. While Margaret was here, we ambled down to Bellevue by way of the Great River Shakespeare Festival in Winona (Twelfth Night) and the American Players Theater (Measure for Measure) in Spring Green, Wisconsin. While in Winona, we popped into the Minnesota Maritime Art Museum which had opened for the first time that day. We were pressed for time; it was 4:30 when we got there and they closed at 5:00, so they let us in for free. They have a lot of gorgeous seascape paintings (weirdly out of place in the middle of the continent, but still lovely), some painted carving folk art display, and a set of photographs taken by Henry Bosse, an Army Corps of Engineers guy in the 1880s. Included in these was a photo of the Short Line Bridge in 1885 or so. It was pretty cool to see a 120-year old photo of the bridge that I had just included a photo of in my blog. I intend to return to the Museum when I have a bit more time. One might ask why there's a Maritime Art Museum in Minnesota. The story goes that a local senator built a big new house and had a big wall he needed a picture for and ended up looking at maritime scene paintings, many of which are conveniently large, and fell in love with the genre and started buying them. He is kindly loaning them to the Museum for their displays. Frankly, this all sounds a bit odd to me, but I also like this type of art and am happy it's here and that the Senator didn't fall in love with velvet paintings sold out of Ford Econolines in abandoned gas station parking lots. We'll be appearing in Julius Ceasar at The American Players Theater. We actually went and saw Measure for Measure, but a staff guy came out afterwards and said that they wanted to record the crowd scene audio for Julius Ceasar so anybody who wanted to stick around afterwards could do so. We did. We chanted "Cea-sar, Cea-sar!" and catcalls and cheers and other bits, rehearsed briefly and then done in response to the text read by the Brutus actor or the director. There were about 200 of us in the crowd and it was great fun, the noise echoing off the surrounding hills (this APT is outdoors in the Wisconsin River Valley). If you happen to catch Julius Ceasar, when they play the crowd scene audio, that's me and the family and Auntie Margaret and 200 others! In June I rode to Prescott and back to scout out the way in to the Cities from Wisconsin Highway 35. I wrote about this in Breakfast at Enrique's and noted how I'd seen a big country house called Cedarhurst that did afternoon teas. When Margaret said she was coming, we decided to go. It was excellent! A lot of tea places (Chickadee Tearoom in Lake City on the Three Speed Tour, for instance) are too cute and not all that good. We've seen a number of attempts go under over the years and often rightfully so. Margaret's an actual tea-drinking English person and Karla and I would auction off English teas at the Manor (our house) at church and they were very popular, due mostly to Karla's superb cooking and also the gin and tonics we'd administer later in the afternoon. In other words, we're a jaded audience. We were very impressed with the tea (the actual drink) and the accompanying 9-course food, from a scone to fruit to sandwiches to, at the end, lemon sorbet sitting in champagne in a glass bowl (this is a brilliant dessert, easy to do, you can scoop it ahead of time, showy and tasty). I'd highly recommend this place if you do teas. Speaking of the Three Speed Tour, the 3ST guys held a special meeting at Barley John's to meet Auntie Margaret. She used a bicycle as transportation for a lot of World War II, including a period when she commuted 16 miles each way in and out of Birmingham. Her brother, my Uncle, was actually bike touring in France when the war broke out. She's not a Cyclist, particularly, but is a direct connection to a time when cycling was a common form of transport for a lot of people in the UK. Now Margaret's gone home, the kids are back from camp, the bulk of Dad's stuff is moved, maybe I can get back to more normal life. It wasn't like I gave up riding during all this. In fact, distressed that most of my miles were accruing on the Big Red Schwinn (8-speed Nexus), I commuted a few times on the Atlantis. Karla and I have done a few rides, and she is getting more comfortable with the bike and with the distances I like to ride and may start commuting to church on the non-rehearsal days pretty shortly. Henry's been riding but somehow managed to bash up his rear derailleur pretty badly and it needs replacing. I've ordered a derailleur and shifters for his bike and will probably do that this weekend.